If you thought my last recipe (brown sugar ice cream with a miso caramel swirl) was a bit too complicated, then this one’s for you. It’s so simple that even my six year old daughter can make it without help. I’m not snobby about the use of tinned mangoes here because in Nottingham really ripe, fresh ones are hard to come by. This sorbet is good to make alongside regular ice cream because it uses the egg whites that are not needed for that. 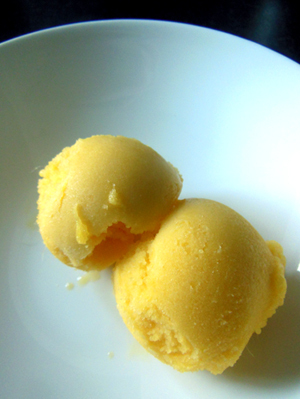 The egg white helps to emulsify and stabilize the sorbet giving it a nice smooth texture. Now all we need is some nice sunny weather (it’s pouring in Nottingham today). Put the tins of mango in the fridge until cold. Pour the mangoes and their syrup into a blender, add the egg whites and puree until really smooth. If you’re not eating the sorbet straight away then put the mix in an old ice cream container or Tupperware and place in the freezer. Take the sorbet out of the freezer for at least half an hour before you plan to serve.